Have you ever eaten filet mignon off of a paper plate? How about driven a Honda Civic with a supercharged V8 engine? The Spyderco Native 5 with S110V blade steel and dark blue FRN handles is part of the same sort of unequal equation. The end product is very good, but somehow things are diminished because they are just presented in a manner that dilutes the root appeal. Still, a lot can be said about a “sleeper”… a wolf in sheep’s clothing that you never saw coming. Something that seems altogether ordinary to the uninitiated, but hides itself in plain sight just waiting to pounce. That to me is the best way to describe the Native 5. While it leaves no lasting impressions, the Native 5 is a perfectly adequate and affordable EDC. The Spyderco Native (#C41) has been a longtime cast member in the Spyderco line-up. It has been offered in various iterations throughout the years, first appearing as early as 1997 and the fifth generation Native 5 making its debut in 2012. Some versions have seen CPM-S30V and S35VN steels, others with different handle scale materials. Two things however remain constant between all versions that have been released to date: The Native is always a Back Lock (aka LockBack), and the style is always just about the same with its classic style and utilitarian profile with a pronounced finger choil on the blade. The appeal of the Native has always been about classic styling and value. It is not too often that a knife that appeals to the mature demographic also appeals to the younger up and coming enthusiasts. The Native 5 is one example that exemplifies this classic yet modern approach to an EDC. In this review I’m focused on the Spyderco Native 5 model C41PDBL5 with Dark Blue FRN handle and the CPM-S110V blade, released in December 2015. “Beauty is a joy forever”. John Keats wrote those words, and he was right. If you are a true knife guy, the classic shape of the full flat-ground spear point blade made from premium CPM-S110V is all sorts of beautiful. It is truly the attraction of this knife, and attract it does. At 2.97” inches in length with a 2.42” cutting edge, the 0.125” thick blade is the definition of high performance small EDC blade steel. This is worth the price of admission. CPM-S110V is not a very common blade steel that is used on standard production knives. Developed by US-based Crucible, this stuff is very expensive and it is not easy to work with given the hardness of the material. Dubbed the super-steel of super steels, many regard CPM-S110V as the ultimate in available super blades on the market today. Spyderco has been one of the early adopters of S110V, now offering it on several of their production favorites like the Manix 2 and the legendary Paramilitary 2. If you like knowing you have the best, but don’t like to show off or spend through the nose, the Native 5 makes its case right here. The classic shape is very useful as we will discuss in the performance section of this review. It is both a very useful and attractive blade. It is undeniable that the Native 5 in any configuration is a comfortable EDC in-hand. Though a bit cheap in appearance (our model version), the dark blue FRN handle scales feel comfortable, and the texture pattern provides solid traction and grip. With the use of the finger choil, a full 4-finger grip can be achieved comfortably for small and mid-sized hands. Additionally, the Native 5 feels very light to hold and carry. At only 2.5 ounces, it is well positioned to be a perfect camper tool or bugout bag companion. It is not only light, but well balanced for a back lock constructed knife. Positive attributes continue as the Native 5 offers excellent jimping on both the spine and the finger choil. But like most things, downsides also exist. Though the knife is aided in its light weight characteristics with the use of the FRN scales, they feel a bit flimsy when gripped with force. That is not to say that they will break, but rather the solid feel that some gain confidence in while holding a more rigid knife is not present in this representation of the Native 5. But this is the trade-off that many may be willing to make. After all, have you ever broken or warped a handle scale just by holding it tightly and performing moderate usage in everyday scenarios? We would imagine not. Even still, it is nice to have a confident feel for the tool that is being used. The next item on the downside list is the pocket clip. As an EDC it is very important that the pocket clip is both functional and non-distracting. The pocket clip that has been chosen for this (and most other) Native 5 is the classic bent spring clip. Granted it is a classically functional clip, but boy would we have loved to have seen Spyderco use the deep carry paperclip style design for this knife. The full size clip almost seems counter to the design concept of the minimalist ultra-lightweight design. And as a full size pocket clip, it can get in your way a bit when really grabbing on tight for traction when hard using it. Good news is that it is all sorts of configurable – the clip can be adjusted for tip-up, tip-down, left and right handed carry. Now let’s briefly discuss the back lock. The implementation is very well performed, and the spine of the knife is well finished. The lock mechanism is neither too hard nor too soft to engage. Spyderco has really perfected this classic lock mechanism. Tastes may vary as back locks have fallen out of favor as a result of more one handed friendly closing options, such as the frame lock and liner lock. Either way you look at it though, the back lock is a time tested mechanism that works very well for standard tasks and users. What is a knife review without actual real world testing? We decided to carry the knife as our primary EDC for just over 2 weeks and gave it a solid workout along the way. Because the blade was already screaming sharp out of box, we did not alter it in any way from how we received it new. Throughout the couple of weeks, we performed standard tasks that most would conduct during normal EDC usage. These included cutting rope, opening packages, some minor food prep, and even a bit of prying. The full flat ground spear point blade is a great design. This blade shape has been around for a long time, and as such it has stood the test of time. The full flat ground makes this ~3 inch blade a super fine slicer. Cutting through boxes, and opening packages is nothing for this small EDC. Even some minor work in the kitchen lent itself extremely well. We cut fruit and vegetables very well as the Native 5 can easily substitute for a paring knife in the kitchen. Thinly sliced garlic is a breeze to make when using this knife. With the CPM-S110V blade steel, we did not have to worry about corrosion issues either thanks to generous amounts of chromium and niobium present in the 110V alloy. Moreover, the FRN (some people call them Zytel) scales made it a breeze to hold onto the knife under slippery and wet conditions. 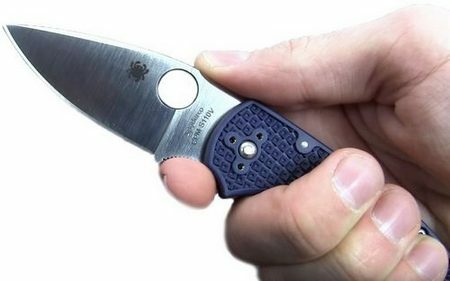 Deployment is very easy (though not super-fast) with the use of the Spyderco ‘Spydie hole’ we are all so familiar with. If we were to nitpick we would probably get into some detail about how the deployment hole could be better rounded off, but in reality it is quite sufficient and aids in usage under conditions when gloves are used. Our overall impressions after carrying the knife and using it for standard tasks is that the Native 5 in this configuration would make for a wonderful camping knife. Additionally, it would make for a great secondary carry EDC solution. Over the course of the two week EDC, we decided that the best way for us to carry the Spyderco Native 5 was sans the pocket clip. Yup, you read that correctly. We removed the pocket clip entirely and just pushed the knife deep in our pocket old school. We found that it seemed to disappear in the pocket because of its relatively diminutive footprint and light 2.5 oz. weight. When the clip was on, the knife always felt noticeable in the pant pocket, and sat up a bit from the pocket which caused some minor discomfort when in the seated position as well. Of course, your mileage may vary. Further, this is not an uber-expensive offering that costs hundreds, and it would not be hard to purchase again at a local merchant. So in the unlikely event that it somehow managed to fall out of our pants pocket we would not be as upset as if a 400 dollar semi-custom or high-end production offering disappeared. That said we enjoyed the traditional carry of the knife without the pocket clip. It almost felt a bit nostalgic given the traditional type setup of the knife. At the end of our two weeks we reviewed the blade sharpness. The Spyderco Native 5 with S110V certainly held up to every task we put in front of it. The sharpness of the knife seemed to hold up extremely well. Whether you buy into the concept of super steels or not, the proof is in the pudding. CPM-S110V and the Spyderco heat treatment of it appear to be spot on the mark. We saw no need to sharpen or even strop the knife. The blade after two plus weeks of use still performed about the same as when we received it, and cuts through paper effortlessly as well. That said, we wince at the idea of having to sharpen this steel. That is the trade-off between high performance super steel, and more practical common place steels. The Spyderco Native 5 with Dark Blue FRN Handles (Model C41PDBL5) can be seen as something of a bargain. It is hard to find companies outside of Spyderco that offer CPM-S110V at such an affordable price of about 110 dollars. The fact that Spyderco kept manufacture in the US is all the more impressive. The only practical competitors are other Spyderco products, and most other versions of the Native 5 itself. Check below for some competitive options. Spyderco C41GPDBL5 Native 5 S110V with G10 textured blue/purple scales (~$150) – Like the knife we have reviewed the Native 5 model C41GPDBL5 offers the CPM-S110V super steel and same design configuration, but substitutes the FRN handle scales in favor of G10 with almost the exact same color profile (though in G10 tends to look purple). For some this is a very reasonable upgrade, for others it might be seen as an unnecessary increase of weight to 3.7 oz., a net increase of about 1.2 oz in total from our model being reviewed. Additionally, the price is raised to about $150, and increase of about 40 dollars. Spyderco C41CF40TH 40th Anniversary Native 5 with Damasteel Blade, and Fluted Carbon Fiber (~$360) – If a more chic EDC is your choice of carry, the soon to be released 40th anniversary model C41CF40TH with DS93X Thor patterned damasteel blade and fluted carbon fiber scales may be the Native 5 for you. Proportions are all the same as other Native models; however because of the carbon fiber we see a still very light weight design of 2.7 oz. This limited run offering of 1200 pieces is sure to appeal to both collectors and enthusiasts looking to drop about 360 dollars from their bank accounts. Benchmade 556-1 Mini Griptilian (~$160) – This Mini Griptilian from Benchmade is a cut above other mini grips in the line-up with attractive G10 grey scales and CPM-20CV blade steel. With a cutting edge of 2.91 inches, and 2.88 oz weight, the 556-1 Mini Griptilian makes for a great combination of small but functional and attractive EDC. At about 160 dollars this knife is a bit more expensive when compared to our Native 5, but is certainly worth considering nonetheless. My review here. So what are we to think about the Spyderco Native 5 with CPM-S110V and dark blue FRN handle scales? In some respects it is a supreme bargain to get a wolf in sheep’s clothing such as this. However, in other respects it is a bit disappointing to see such an amazing blade get fitted with a handle that can just as easily find a home being used in 20 dollar production knives produced out of the Asian Pacific. This however is not a 20 dollar Chinese knife, it is a high quality production offering made in Golden Springs Colorado. So should we expect more? Should we be content with this blade alone, knowing that if used in a thousand dollar custom nary a complaint would be uttered? Perhaps it is more about the application and purpose of use; The Native 5 in this configuration sits at a crossroads between entry-level and mid-level production knives, and promises high quality and durability for real EDC users, not for collectors or as a gentleman’s carry to be worn with a tux. It even tries to bridge the gap between traditional style and modern materials and engineering – It has certainly achieved that well. But with the pocket clip and FRN handles, it will never be anything but a high level American made budget offering that attempts to punch above its weight class. For us, we find the Spyderco Native 5 (Model C41PDBL5) fits most at home in a camp or backpackers system, and that’s not a bad thing at all. For you however, perhaps you might love the idea of carrying a “super blade” in your pocket, knowing that you alone are truly the only one aware of how special it actually is.